These are just as good and maybe a little bit better than standard Pop-Tarts. Almost a year ago, I reviewed Whole Grain Pop-Tarts from Kellogg's. They were alright, but there was a wheat flavor in every bite that seemed at odds with the sweet fillings. With these re-worked whole grain Pop-Tarts, Kellogg's finally got it right. The whole wheat flavor is now minimized. It's still there if you think about it, but it plays much more of a supporting roll - letting the fillings and frosting shine. I tried two varieties of 20% Fiber Pop-Tarts: Frosted Strawberry and Brown Sugar Cinnamon. I can't say I preferred one over the other. They were both very good. From a flavor perspective, these struck me as classic Pop-Tarts with a heartier casing and more fiber (5 grams of dietary fiber per serving). On the negative side, these new Pop-Tarts do contain a certain amount of saturated fat (1.5 grams for the Strawberry variety and 2 grams for the Cinnamon variety). I'm also still miffed that it's not better identified that a serving consists of a single Pop-Tart. They really should package the pastries individually or make some effort to thwart a natural inclination that one foil package of two pastries constitutes a serving. On the whole, these were good products. If you buy Pop-Tarts occasionally, give these a try instead of the non-whole grain Pop-Tarts. They satisfy the Pop-Tart craving and they're a little healthier... so what the heck, right? 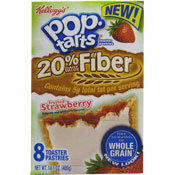 What do you think of 20% Fiber Pop-Tarts? I got a pack of the BSC ones yesterday and they are a winner! Full frosting (although thin) instead of lame squiggly lines. Good flavor crust. Nice filling. They got it right this time and better not mess it up. 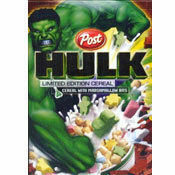 I did NOT like the whole grain ones for reasons you stated. A new fave in our household. And a few notches down on the guilt scale!! Great tasting. Same brown sugar and cinnamon flavor as the regular ones. Yay! The new kind of Pop-Tarts are a healther alternative to the Strawberry Pop-Tarts, which is good!